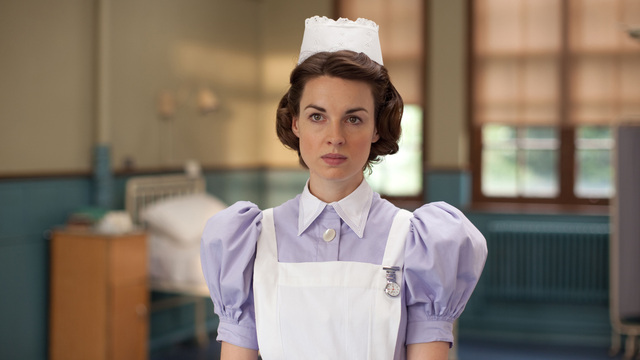 Neal Street Productions There are so many wonderful story lines in Call the Midwife. I enjoy watching the friendships that have developed between the midwives. I like how the show’s creators give us a glimpse into the lives and emotions of the nuns but still keeps them somewhat apart from the others. Watching the interactions between the midwives and the doctors, with all its give and take, is so similar to my experiences. Henry Ford Hospital in 2013 is across the ocean and 50 years into the future from the setting of Call the Midwife but it feels like the writers of the show understand both places intimately. The parallels between their world and mine amaze me. Maybe it’s because I just finished a three night stretch on the Labor and Delivery unit but the story line about the Carter sisters, Meg and Mave, drew me in tonight. It keeps coming back to trust. The sisters do not trust the 1958 modern ways of the midwives and medicine, but Mave is worried about her delivery. I have many patients in my practice from other cultures, Bangladesh, Yemen, Mexico and northern Africa. Detroit is a melting pot very much like East end London in the 1950s. Each culture has unique traditions about pregnancy, birth and women’s roles in the family. I have learned a lot and have come to appreciate and respect much of it. But sometimes there is resistance to new ways. Sometimes they view the tests and checkups as a lot of fuss over a natural process. “That is not how we do it back home,” is a phrase I am very familiar with. But like Trixie and Dr. Turner, sometimes you have to speak out and say medicine and childbirth have evolved. I am happy to have ultrasound to see twins. I am glad for the medicines that ease pain and help with the problems that can crop up. We have skills and knowledge that can help make women and babies safer and healthier. Patients don’t always listen but many times with patience and respect and some plain talk good things happen. Sister Bernadette, Trixie and Dr. Turner handle a major crisis of undiagnosed twin delivery with a placental abruption in an older first time mother at home, no less. The same case would cause more than a few gray hairs to pop out for me in my modern Labor and Delivery unit with all its equipment and help. Plain talk, asking for and receiving trust of the patient and family, skill and probably a good dose of luck prevailed for the Carter sisters. It happens that way for me too at my job. That is what is so special about Call the Midwife. It captures the joy and adrenalin and camaraderie that I experience as a midwife so very well.